Label and Catalogue Number: Atlantic SD 1311. Personnel: John Coltrane (tenor sax); Tommy Flanagan (piano); Wynton Kelly (piano); Paul Chambers (bass); Art Taylor (drums); Jimmy Cobb (drums). Side 1: Giant Steps; Cousin Mary; Countdown; Spiral. Side 2: Syeeda’s Flute Song; Naima; Mr. P. C.
Recording Date: 4 May 1959 and 2 December 1959 at Atlantic Studios, New York, NY, USA. A word before we get started: I first attempted to draft this posting in October 2015 but found it hard to get right and resolved to put it aside and make a second attempt at a later date. Last week’s sad news of the death of Nat Hentoff was the spur I needed to force me to return to this posting and finish it off. Hentoff was one of the golden generation of jazz writers. He was an Associate Editor of Downbeat in the 1950s and subsequently columnist and jazz critic for the Village Voice for over fifty years. But he was so much more than that and wrote extensively on matters affecting jazz, jazz musicians and far beyond. In direct relevance to this posting, he was the author of the liner notes for Giant Steps. That may seem to be a small thing to say but I wrestled hard with writing about this record and I had the benefit of over fifty years of the collective hindsight of the jazz loving community. Hentoff had no such luxury: he had to write the liner notes before the general public had heard the record, before musicians had assimilated it and before critics had published their reviews of it. That’s a scary prospect at the best of times, even more so when you consider the vulnerable position in which the liner note writer is placed. There’s no hiding place, no chance for a rewrite and no means to retract. Every person who handles the record gets to see what you wrote – for good or ill, it’s there for posterity. Hentoff’s Giant Steps liner notes are a triumph over these odds and serve has a lasting testament to his great taste and prescience. Writing about any Coltrane record is a daunting prospect – all the more so when you’re a jazz fan and record collector rather than an actual musician. I’m simply not competent to write about “Coltrane changes”, minor thirds, fourths and pedal tones so look elsewhere if you seek such erudite analysis. What I can write about is Giant Steps in the context of Coltrane’s discographical chronology and my personal response to the music. Coltrane’s tragically curtailed career can neatly be parcelled into four stages. The first stage runs up to the late 1950s and encompasses his output on Prestige Records and his time with Miles Davis and Theolonius Monk. It is basically the story of a young man learning his craft, serving time with masters and establishing the genesis of his own ideas. 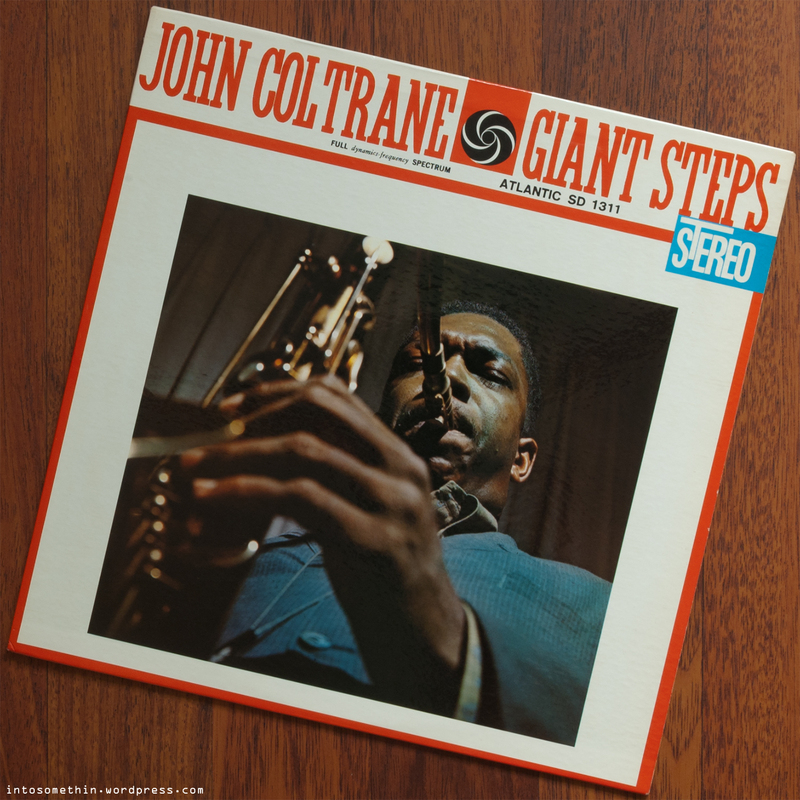 The second stage coincides with Coltrane’s period recording for Atlantic Records and shows a man outgrowing his mentors, stepping out on his own career path and starting to make waves. The third and fourth stages of Coltrane’s development cover his involvement with Impulse Records with the boundary point coming at A Love Supreme which, in simplistic terms, demarks the modal explorations of the “classic quartet” from the final years of adventure into spiritual and free jazz. 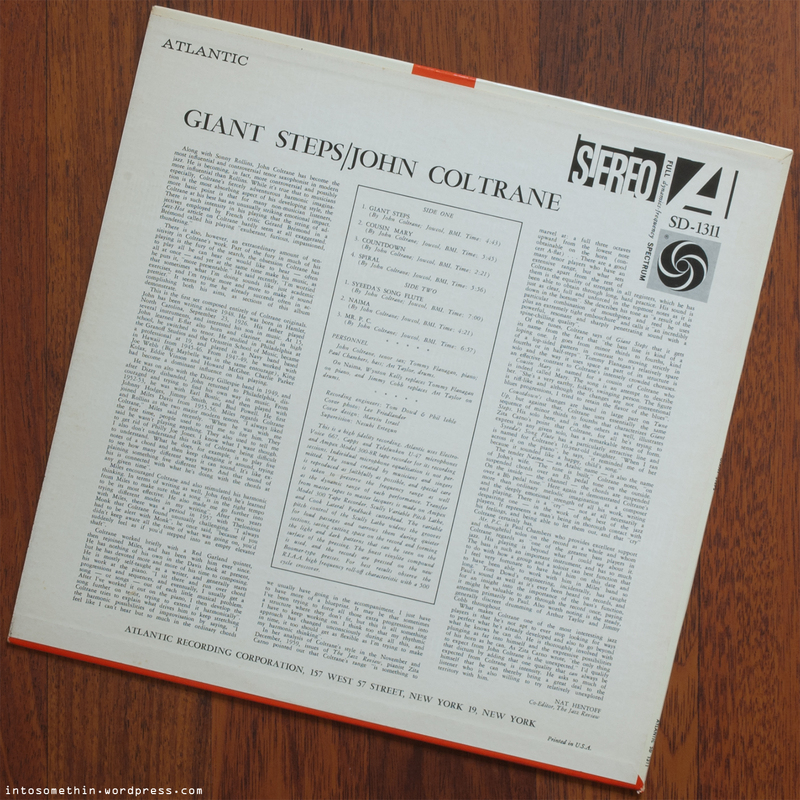 Giant Steps comes at one of the pivotal moments of this journey: close to the exhaustion of Coltrane’s bop legacy with his Atlantic sessions and near the beginning of the deep dive into modal jazz. It’s this threshold that sets up the vital tension at the heart of the record. You can sense it in the music and you can see it in the choice of personnel. Even more, you can detect it in how that personnel responds to the challenge. Coltrane chose loyal friends and compatriots for the sessions that yielded the selections here: Chambers, Cobb and Kelly were fellow Davis alumni while Flanagan and Taylor were elegant exponents of the bop idiom. But Coltrane’s loyalty seems in conflict with his desire to move forwards musically. The rest of the band are, of course, all masters in their own right but Coltrane’s firm grip on the steering wheel drives them into terra incognito. You can especially feel the uncertainty with both the pianists’ responses to Coltrane’s performances. On any other record, by any other tenor player, they’d be great turns but here they’re out manoeuvred by Coltrane and fall back on the familiar. Don’t get me wrong: it’s a familiar that I love from two of my favourite piano players who both have tremendous pedigree. But by this stage, Coltrane is ready for a different breed of sideman. Another fascinating aspect of the loyalty theme comes in the form of the titles Coltrane used for the tunes recorded here. Four of the seven tracks have personal connotations: one for a cousin, one for his then-wife, one for his step-daughter and lastly one for his close friend and fellow musician Paul Chambers. It’s as if the anchor of strong relationships was something Coltrane valued highly while trying to navigate turbulent musical waters. Perhaps this was an early hint of the later spiritual path Coltrane and his music would follow? But for now, the music takes the underpinning blues of bop and subjects it to high tension. The title track must be one of the most analysed performances of all time. I’m no musician yet I can perceive that Coltrane’s gift here was to make the technically demanding sound natural and easy. The rest of the LP follows the same pattern of a master’s ability to make the complex seem deceptively simple – whether it’s blues-based tunes like Cousin Mary, beautiful balladry like Naima or over a full tilt rhythm section as on Mr. P. C. – emotion, intensity and technical facility override all obstacles. Every so often though, you do find yourself gasping for breath when Coltrane delivers a flurry of notes with extreme pace and precision. I’m not going to attempt a track by track run-down on this occasion. Suffice to say that at least three of the album’s seven tunes are now standards and the remainder are, if anything, only a hair’s breadth behind. The one listening observation I will make is that owning this stereo pressing and contrasting it with other mono pressings of Coltrane records I own confirms that Coltrane in a quartet setting is more compelling in mono. At least, that is, if you want to focus on the saxophone. If you want the more holistic whole-group experience then there is something to be said for the stereo. Above I promised you controversy and revelation so let’s get to them. My revelation has been a record cleaning experience. Of course, if you’re reading this you are unlikely to need convincing of the value and efficacy of record cleaning machines. If you’re like me, your experience has probably been of one of the range of fluid/vacuum based machines however I enjoyed my first encounter with an ultrasonic record cleaning machine last Autumn. It began, let me be honest, with disappointment because this record was advertised as being “in Near Mint/Ex condition with one very light mark and clean labels, plays great” but my first playing of it delivered an awful lot of crackles and pops. After a brief interlude of teeth grinding, sense prevailed and decided that a good clean was in order before complaining to the seller. It was at this point that I remembered that my local high end hifi dealer offers a record cleaning services with its newly acquired Audio Desk ultrasonic record cleaner. So the next available Saturday morning saw me ensconced in the hifi shop’s upstairs room and trusted to operate the machinery for myself after some brief instructions. Three things struck me: first, it’s very easy to use; second, it’s actually relatively quiet; third, the results are outstanding. And the full track above was recorded after only one cleaning cycle, so I imagine that another one or two cleaning cycles would really gild the lily. The only downside is that these ultrasonic cleaners are exorbitantly expensive. There’s no way I can afford one so I’m extremely fortunate to have access to a cleaning service nearby that uses one. Since then, I have discovered a number of other possible semi-DIY routes to affordable ultrasonic record cleaning but that’s a topic for another day. As mentioned at the start, the liner notes come courtesy of the fine writing mind of Nat Hentoff. In some ways it would be easy to mistake these notes for another run-of-the-mill outing. Yes, there’s some biographical career background about Coltrane and, yes, there’s a tune-by-tune breakdown but there’s something more subtle going on. Something, dare I say it, prophetic about Hentoff’s insights into both this record and what it held for Coltrane’s future. Right from the start, we’re treated to a bold assessment: “Along with Sonny Rollins, John Coltrane has become the most influential and controversial tenor saxophonist in modern jazz.” Hentoff immediately goes further: “He [Coltrane] is becoming, in fact, more controversial and possibly more influential than Rollins”. The remainder of the essay is littered with references to Coltrane’s intensity, the emotional impact of his playing and his constant search for new ways to progress and improve. He is aided and abetted in this by direct quotes from Coltrane himself. In the end though, as with so much of Coltrane’s music that was yet to come, the challenge wasn’t Coltrane’s alone to face but one he set for the listener. Hentoff sums it up when he concludes with this about Coltrane: “He asks so much of himself that he can thereby bring a great deal to the listener who is also willing to try relatively unexplored territory with him”. It’s at this point that we finally enter the area of controversy. 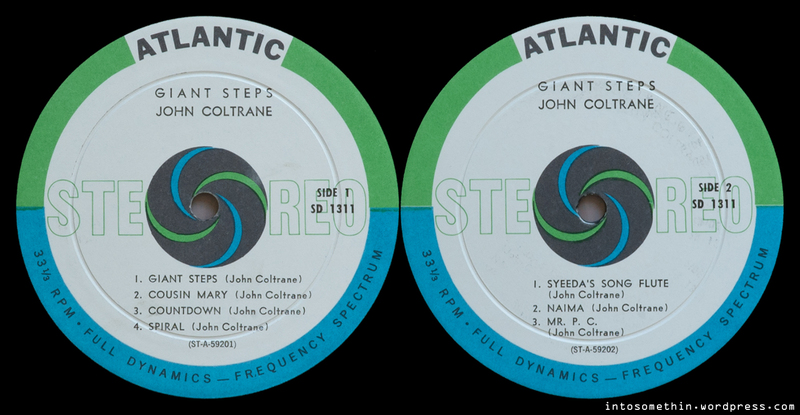 There’s no dispute that mono first pressings of Giant Steps are adorned with Atlantic black labels but what of stereo first pressings? There seems to be a widespread belief that they should sport the Atlantic green labels but I’ve reached the conclusion that this is incorrect due to being based on two false premises. The first premise is the assumption that the stereo first pressing was released in 1959 at the same time as the mono first pressing. On that basis, one would expect the stereo version to have the green labels but it wasn’t released until the following year. The second premise is that a number of individuals have asserted on various Internet fora that they own or have seen stereo first pressings with green labels. The problem here is that all such assertions that I’ve seen are not backed up with photographic evidence. It leads me to wonder if some of these individuals have mis-identified escaped green label copies from the The Heavyweight Champion: The Complete Atlantic Recordings box set or one of the audiophile re-issues as first pressings. If geneuine green label stereo first pressings exist, then I would have expected one to have turned up in an eBay auction by now but not one of more than a hundred auctions dating back to 2006 listed by my Popsike search for “coltrane giant steps stereo” claims green labels. So, in the absence of definitive counter-evidence, my current working assumption is that stereo first pressings of Giant Steps come with the blue/green bullseye labels like my DG ones pictured above. Side One’s deadwax contains a hand etched “AVCO” and “ST-A-59202 59201″ – note that the 59202 is struck out with two horizontal lines (human error strikes even masterpieces); Side Two has the same hand-etched “AVCO” and “ST-A-59202” – correctly this time! The record registered 149g at the weigh-in. The cover is in beautiful condition with generous lamination on the front and really sharp corners. I don’t think I could hope to find one better. I suspect the fact that the stereo wording on the front is over a blue background is a key indicator of a first pressing cover. The bonus prize being that this copy comes with the original black and magenta inner sleeve, also in fantastic condition with no creases, folds or tears. Great photos…sound clip sounds really good too…nice record. My vintage stereo copy of this has the black “STEREO” logo, I prefer the blue and white logo, and I assume the blue/white was first because your copy is a “bullseye” whereas mine was a two-tone blue/green label. I just read through the entire article, it was great. Very interesting comments about Coltrane perhaps beginning to look for accompaniment more willing to explore at this time…great point about the song titles referencing people close to Trane as well, I had never thought about that! At this point in my collecting, a cleaning machine (or access to one) is an absolute must. Glad you enjoyed it Rich. This posting took several attempts over a couple of months before I was satisfied that it was ready enough to publish. The next one will see me back on much more comfortable ground so you won’t have to wait much longer for it to appear! Great write-up. It’s very likely Flanagan had never encountered anything like the now famous (infamous?) Coltrane Changes as he was expected to solo over on the track ‘Giant Steps’, where Coltrane who practiced 10 + hours everyday new these sequences without thinking about it. There are alternate takes where he plays very similar passages so he had clearly worked through it rigorously in advance.